STEREO has a new launch date: April 11, 2006. The STEREO working team meeting took place in Hamburg, Germany at the Hamburg Planetarium. Several news articles were written about the meeting after a STEREO press conference in Hamburg. One article was written by the DPA news service, a German wire service akin to the Associated Press. Google and Yahoo showed about 40 newspapers/webpages picked up the story. There was also a TV story on STEREO and an article in the STERN magazine. Most of the articles quoted Mike Kaiser of NASA and Janet Luhmann of Berkeley. Volker Bothmer was also quoted along with Thomas from the Planetarium. STEREO is getting ready to ship all the instruments to NASA for testing and integration on to the spacecraft. Learn more here. Dave Curtis and Jeremy McCauley successfully delivered the FM1 IMPACT Boom with SWEA, STE and MAG FM1s attached, to APL last week. 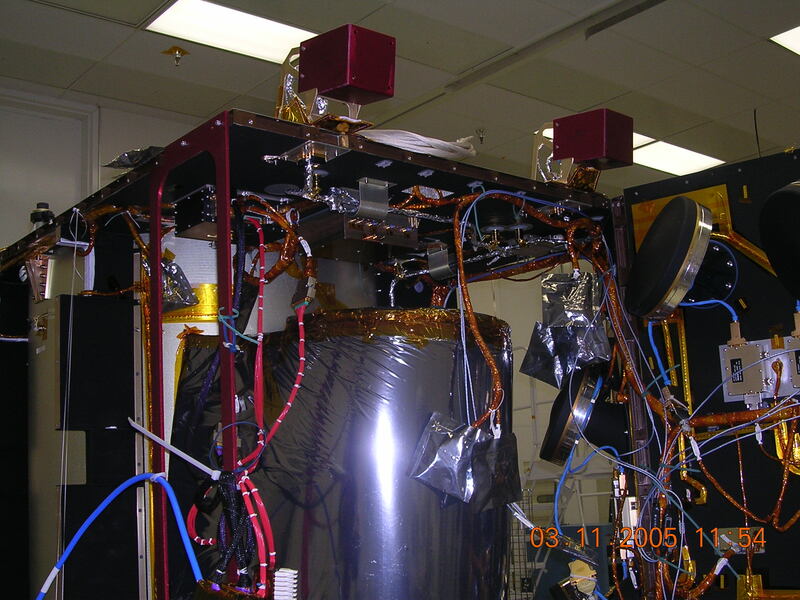 It was bolted to the spacecraft as a fit-check (see image). Looks great! It came off until a SWAVES box gets attached in the next week or so. Thanks to all the Boom suite participants for reaching this milestone. Still need to finish up environments test on the SEP suite and remaining tests and delivery on the Boom suite FM2. Dave Curtis (UC Berkeley Space Sciences Laboratory) has visited APL to deliver the very first peice of STEREO instrument hardware for integration into STEREO-A. View an image of FM1 IDPU box here. Dr. Laura Peticolas gave a talk at the American Association of Physics Teachers on the STEREO-IMPACT Sounds of Space project. Find out more about this project here. he two magnetism teacher's guides, "Exploring Magnetism" and "Exploring Magnetism in the Solar Wind" were printed and are ready for teachers to use in the activities and worksheets in their classrooms! They are available online here or email us at outreach@ssl.berkeley.edu FIX THIS LINK and request the printed guides to be sent to you.